My breed originated in Siberia and was brought to Britain in 1889. My lineage is pure, having been untampered with by man through the years. This is indeed a rarity in the dog world! I look a great deal like a Japanese Spitz, but I am a lot bigger than they are. I come in white only, even though the "white" can vary somewhat from pure white to silver to sort of a biscuit color. My coat is very thick and harsh, and I have a short, thick undercoat that makes me pretty weather-resistant. Regular brushing is a necessity. I mind very well and I get along with children, making me a good choice for a family pet if you have room for me to exercise properly. When fully grown, I am between 18 and 23 inches tall (45.7 to 58.4 centimeters) and I weigh between 50 and 65 pounds (22.5 to 29.3 kilograms). 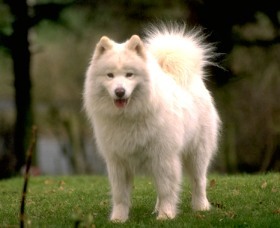 We have no Samoyed Breeders listed at this time. Click here to place your Samoyed Ad!